"Is there a doctor in the motherf—ing house?" 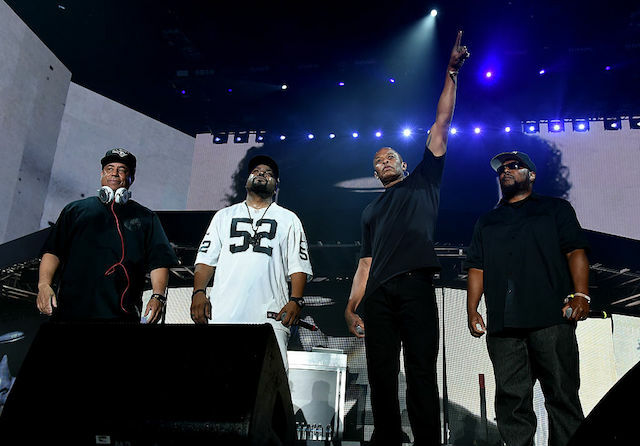 For the first time in 27 years, the surviving members of N.W.A shared a stage, as Ice Cube performed with Dr. Dre, MC Ren, and DJ Yella at Coachella on Saturday night. Ice Cube was first joined by Ren and Yella as they performed "Straight Outta Compton," before Ice Cube introduced the son of Eazy-E to the stage. With Lil&apos; Eazy-E, they performed his father&apos;s classic solo track "Boyz-n-the-Hood" and N.W.A&apos;s "F— tha Police." "I said we were gonna have N.W.A. Somebody&apos;s missing," Ice Cube addressed the crowd according to the L.A. Times. "Is there a motherf—ing doctor in the house?" Dre emerged from the top of the stage, and they ripped through "Still D.R.E." and "California Love." To top things off, Kendrick Lamar appeared towards the end of the set, and performed his anthem "Alright." Earlier this month, N.W.A was inducted into the Rock and Roll Hall of Fame.